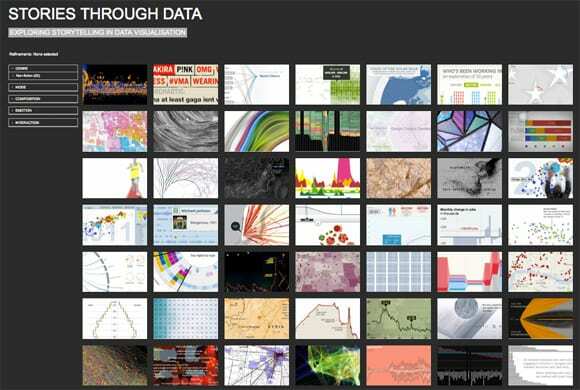 HomeVisualising data: can you see stories? I really like that this classification includes both spatial and linguistic aspects of information. This classification characterizes the *how* of a dataviz piece. I would love to see included here a discussion of how the *why* of the piece helps shape the design decisions for the *how* of the piece. The category above called ‘Purpose’ is describing facets of *how* — the form the information takes, the way the information behaves (e.g., “part to whole relations”). The ‘Purpose’ category doesn’t capture the *why*. Why would I want to make part to whole relations? In what context? What is the designer/audience attempting to accomplish? If that why part is clarified, it serves as a litmus test to decide if (& then how) to include narrative in the variety of forms characterized here. It removes the argument that I need to be “pro” or “con” narrative. I map that design decision back to a clearly stated design problem and ask, “does narrative help solve this?” If yes, “what kind of narrative solves my specific situation, nature of my data, etc. ?” This places storytelling/narrative as another design tool in the tool box to be used as situation suggests. I would love to see included in the proposed Framework for Analyzing Storytelling in Visualization a discussion on considering how well the chosen linguistic/spatial forms of information that appear in a given piece map back to the *why* of the piece. That discussion depends on context/audience/content for each piece and is tough to generalize (though there are ways to abstract it and spot patterns at a higher level. For example, http://www.slideshare.net/kaarinh/using-abstraction-to-increase-clarity ). Thanks for your comment, and yes I agree that the *why* needs to be a logical next step. One thing I’m aiming to do, after I’ve classified a lot more samples, is to look for patterns or gaps say in the use of specific visualisation approaches (say part to whole relations, network etc) and why that might/not best relate to a story type.